Notes | If every picture tells a story, every slide tells an even deeper one. Tucked away in Sports Illustrated's photo archive sits 50 years worth of film, a frame-by-frame depiction of the history of sports over the last half a century. The stickers and scribbles along a single slide's border are like tags on a streamer trunk, telling the story of that photo's journey from the playing field to the magazine. This book selects the most colorful of these slides and presents the mounts as objects of art in an oversized 176-page collection, complete with behind-the-scenes vignettes of how the shots came to be. Some slides capture classic SI cover images (Dwight Clark's catch in the 1982 NFC Championship Game or Brandi Chastain ripping her shirt off at the 1999 World Cup) while others are simply great photos (Pete Rose running at full speed or Joe Namath lounging poolside before Super Bowl III). The images themselves are iconic, but by seeing them as slides you get that extra step back. You can see the history that has been made from these flashes of an instant. Comments | [06/23/10] Got my copy from amazon about 3 weeks ago and it's a unique feeling going through its pages! Worths every penny. Comments | [07/17/09] really great book. If you shot for SI... it's fun to look back... if you didn't... it's a unique look under the hood. I was lucky and got a frame in the book... so I'm prejudice.. Comments | [06/10/09] Brad and others - Thanks for your comments on this book. From looking at this book's description on the Amazon site, I bought it with their 1-click service. Can hardly wait to see it. Yowza! Comments | [05/22/09] Awesome book and great insight into the world of SI. I finally was able to get a copy recently. At least for me, you can just back and forth and investigate the full frame of each slide and simply wonder, especially for the older captured shots. There is a whole lot of history in contained in this awesome format and I am very happy to see blank white space utilize in the layout. Best part is that SI photographers still producing awesome work day in and day out that in this collection. I look forward to whatever SI produces next. It will be hard to top this book. Comments | [05/21/09] Really a beautiful book and a piece of photographic history. Comments | [05/03/09] I used to shoot some slides, but this era in professional sports photography was, for all intents and purposes, "before my time". Given that, it is great to see these images, stories, etc spilled out in this form. Amazon shipped me this last week with the jacket torn, but the base is a nice red (which is our living room accent color!...dont laugh) so it goes great on our coffee table! I saw my dad yesterday and with every flip of the page he was rattling off the names of all the players of old. 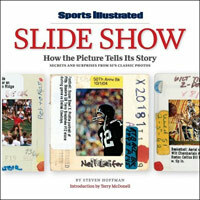 It covers a nice, wide range of sports and eras and like SI knows how to do so well, it gives us photo/sports nerds a lot of detailed info like what each sticker and marking on the slide denotes, yet still carries enough mass appeal in case you want to buy it for a friend outside the biz. Comments | [05/01/09] Got my copy yesterday and couldn't wait to leaf through it. Terrific idea and unique way to display photos. It reminded me of " the good old days", editing chromes with my Schneider loop on the light box, stamping my copyright on the slide mounts and ID'ing the players. I even used the blue and red dot system as well. Well done SI. Another fine coffee table photography book. Comments | [04/30/09] This is a wonderful book. Like Brad, I miss shooting chromes. One of the neat things about this book is how the original chromes are shown full frame and then how those images were cropped into for famous Sports Illustrated cover shots. The book is very well done! Comments | [04/27/09] This is one of the best books Sports Illustrated has put out in a long time. If you love photo books and if you have an interest in the history of American sports photography then you must pick up this brand new book. After seeing the historical value of these cool chromes housed in their marked-up slide mounts from various editors at the magazine it makes me sad that we are not shooting chrome any more! All of your favorites are in here: Neil, Walter, Heinz, Johnny Eye, V.J., etc. Highly recommended!